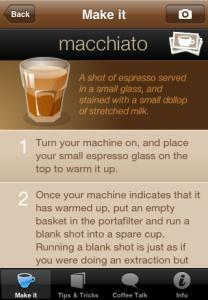 Buy an espresso machine, and you suddenly expect that you will never have to buy another coffee from Starbucks again! Unfortunately, there are some essential skills that you need to master before that dream becomes a reality. Barista helps you achieve that dream. Barista gives you: step-by-step instructions on making the most popular espresso drinks; tips and tricks on making better espresso; * and a glossary of common terms. Barista is available right now from the AppStore. If you'd like to review the application, then promotional iTunes codes are available. Please email, mentioning the website where your review will be posted. Please note that the "Home Barista" application is now named "Barista".